most exciting PR band around, but good. that Roine Stolte walks on, you can guess what I think of this. this is damned impressive, and a good solid listen. Definitely very cool stuff. culture guys play it. Wild stuff. Brilliant. production, but brings the edge back to the sound. SY just keeps getting better. quit, leaving Tillison running the band. It’s completely replaced Po90D as Tillison’s main band. It’s not quite up there with tFK, but it’s damned good. playing something beautiful and subtle. I’m a big Emerson fan. He’s a brilliant pianist. sound like nothing but themselves. but great music, and incredibly silly lyrics delivered in that strange Zappa style. exactly what I’d choose to try to turn someone on to Dream Theater. This entry was posted in Music on July 31, 2009 by markcc. Bill O'Reilly on Life Expectancy: Dumbest Man on Earth? gets off on bullying people. This entry was posted in Bad Economics, Bad Statistics on July 28, 2009 by markcc. My wife is chinese. So in our house, comfort food is often something chinese. For her, one of her very favorite things is dumplings, also known as pot-stickers. They’re time consuming to make, but not difficult. They’re really delicious, well worth the effort. They’re best with a homemade wrapper, but that’s not easy. If you go to a chinese grocery store, they sell pre-made dumpling wrappers with are pretty good. Not as good as homemade, but more than adequate. The wrappers are circular, and about 2 or 3 inches in diameter. These are traditionally made with ground pork. But I don’t eat pork, so I use chicken thighs. Definitely make sure you use thighs – to come out right, the meat inside can’t be too lean – it needs to have some fat in it. Thighs work really nicely; breasts, not so much. When my wife stuffs them, this recipe makes around 30 dumplings. If I’m stuffing them, it’s more like twice that – she somehow manages to stuff an amazing amount of filling into each dumpling. If I try that, I can’t close ’em. 3 boneless, skinless chicken thighs. 1/2 medium sized head of napa cabbage (about 1lb). Thinly sliced green parts of two scallions. A small dish of cold water. Put the chicken thighs and the oyster sauce into a food processor. Pulse until you’ve got what looks like coarsely ground meat. Finely mince the cabbage. Don’t do it in a food processor – that’ll just pulp it. You want it minced into little pieces. Fold the cabbage, soy sauce, and sesame oil into the ground meat. Keep doing that until you run out of either wrappers or filling. Put the dumplings into the pan in shifts. You don’t want them too close together, or they’ll stick to one another. Let them cook for one or two minutes, until the bottom is a nice dark brown. Keep going in batches until they’re all cooked. Serve them with a dipping sauce. Spoon a bit of sauce over each dumpling right before you eat it. one clove of crushed garlic, finely minced. One slice of ginger, crushed and finely minced. Greens of one scallion finely minced. One drop of sesame oil. One half teaspoon of sambal or sriracha chili sauce. These little suckers are seriously good eating. They’re sort of like potato chips, in that once you start eating them, you can’t stop. So make a lot! If you really want to make homemade wrappers (which is a lot of work, but which makes these wonderful little things so much better that you’ll never go back to store-made wrappers), there’s a great recipe for them in Ming Tsai’s “Blue Ginger” cookbook . This entry was posted in Recipes on July 24, 2009 by markcc. right, but which produces drastically wrong results. of this, it looks like what’s going in isn’t garbage. This entry was posted in Bad Economics on July 22, 2009 by markcc. subtle piece: unaccompanied solo piano. Just incredible. is a really fantastic group. the energy or the focus of a band like Isis, but it’s still very good stuff. little band. Not nearly as good as some of the others in my collection, but definitely fun. group that’s heavily influenced by Marillion. They’re pretty good. Not great, but good. I usually wind up skipping past. very highly recommended. Includes a really beautiful fugue section. band. I can’t recommend them highly enough. mechanical way, but somehow, his playing just totally lacks humanity. of them performing this track live, so you can get a sense of what I mean, which is below. This entry was posted in Music on July 17, 2009 by markcc. Here’s the problem: We know that things like N-body gravitational systems are chaotic – and a common example of that is how a gravity-based orbital system that appears stable for a long time can suddenly go through a transition where one body is violently ejected, with enough velocity to permanently escape the orbital system. But when we look at the definition of chaos, we see the requirement for dense periodic orbits. But if a body is ejected from a gravitational system, ejection of a body from a gravitational system is a demonstration of chaos, how can that system have periodic orbits? The answer relates to something I mentioned in the last post. A system doesn’t have to be chaotic at all points in its phase space. It can be chaotic under some conditions – that is, chaotic in some parts of the phase space. Speaking loosely, when a phase space has chaotic regions, we tend to call it a chaotic phase space. In the gravitational system example, you do have a region of dense periodic orbits. 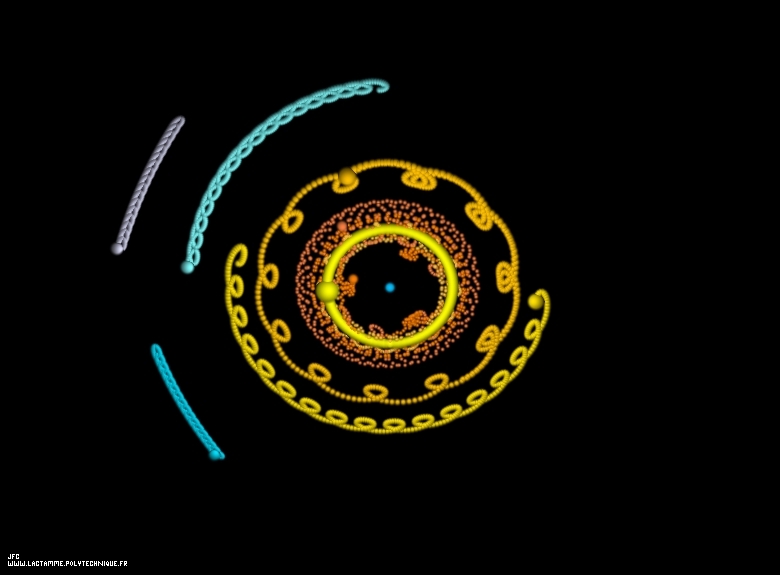 You can create an N-body gravitational system in which the bodies will orbit forever, never actually repeating a configuration, but also never completely breaking down. The system will never repeat. Per Ramsey theory, given any configuration in its phase space, it must eventually come arbitrarily close to repeating that configuration. But that doesn’t mean that it’s really repeating: it’s chaotic, so even those infinitesimal differences will result in divergence from the past – it will follow a different path forward. An attractor of a chaotic system shows you a region of the phase space where the system behaves chaotically. But it’s not the entire phase space. If the attractor covered the entire space, it wouldn’t be particularly interesting or revealing. What makes it interesting is that it captures a region where you get chaotic behavior. The attractor isn’t the whole story of a chaotic systems phase space – it’s just one interesting region with useful analytic properties. So to return to the N-body gravitational problem: the phase space of an N-body gravitational system does contain an attractor full of dense orbits. It’s definitely very sensitive to initial conditions. There are definitely phase spaces for N-body systems that are topologically mixing. None of that precludes the possibility that you can create N-body gravitational systems that break up and allow escape. The escape property isn’t a good example of the chaotic nature of the system, because it encourages people to focus on the wrong properties of the system. The system isn’t chaotic because you can create gravitational systems where a body will escape from what seemed to be a stable system. It’s chaotic because you can create systems that don’t break down, which are stable, but which are thoroughly unpredictable, and will never repeat a configuration. This entry was posted in Chaos on July 16, 2009 by markcc. Anyway… Where we left off last was talking about attractors. The natural question is, why do we really care about attractors when we’re talking about chaos? That’s a question which has two different answers. 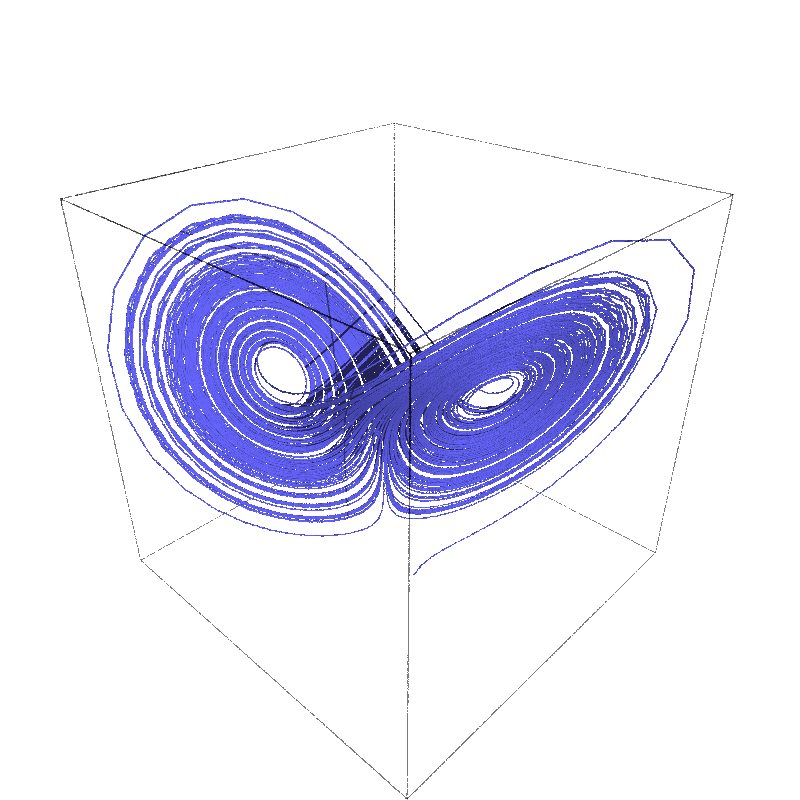 First, attractors provide an interesting way of looking at chaos. If you look at a chaotic system with an attractor, it gives you a way of understanding the chaos. If you start with a point in the attractor basin of the system, and then plot it over time, you’ll get a trace that shows you the shape of the attractor – and by doing that, you get a nice view of the structure of the system. Second, chaotic attractors are strange. In fact, that’s their name: strange attractors: a strange attractor is an attractor whose structure has fractal dimension, and most chaotic systems have fractal-dimension attractors. Let’s go back to the first answer, to look at it in a bit more depth. Why do we want to look in the basin in order to find the structure of the chaotic system? If you pick a point in the attractor itself, there’s no guarantee of what it’s going to do. It might jump around inside the attractor randomly; it might be a fixed point which just sits in one place and never moves. But there’s no straightforward way of figuring out what the attractor looks like starting from a point inside of it. To return to (and strain horribly) the metaphor I used in the last post, the attractor is the part of the black hole past the even horizon: nothing inside of it can tell you anything about what it looks like from the outside. What happens inside of a black hole? How are the things that were dragged into it moving around relative to one another, or are they moving around? We can’t really tell from the outside. But the basin is a different matter. If you start at a point in the attractor basin, you’ve got something that’s basically orbital. You know that every path starting from a point in the basin will, over time, get arbitrarily close to the attractor. It will circle and cycle around. It’s never going to escape from that area around the attractor – it’s doomed to approach it. So if you start at a point in the basin around a strange attractor, you’ll get a path that tells you something about the attractor. Attractors can also vividly demonstrate something else about chaotic systems: they’re not necessarily chaotic everywhere. Lots of systems have the potential for chaos: that is, they’ve got sub-regions of their phase-space where they behave chaotically, but they also have regions where they don’t. Gravitational dynamics is a pretty good example of that: there are plenty of N-body systems that are pretty much stable. We can computationally roll back the history of the major bodies in our solar system for hundreds of millions of years, and still have extremely accurate descriptions of where things were. But there are regions of the phase space of an N-body system where it’s chaotic. And those regions are the attractors and attractor basins of strange attractors in the phase space. A beautiful example of this is the first well-studied strange attractor. The guy who invented chaos theory as we know it was named Edward Lorenz. He was a meteorologist who was studying weather using computational fluid flow. He’d implemented a simulation, and as part of an accident resulting from trying to reproduce a computation, but entering less precise values for the starting conditions, he got dramatically different results. Puzzling out why, he laid the foundations of chaos theory. In the course of studying it, he took the particular equations that he was using in the original simulation, and tried to simplify them to get the simplest system that he could that still showed the non-linear behavior. The result is one of the most well-known images of modern math: the Lorenz attractor. It’s sort of a bent figure-eight. It’s dimensionality isn’t (to my knowledge) known precisely – but it’s a hair above two (the best estimate I could find in a quick search was in the 2.08 range). It’s not a particularly complex system – but it’s fascinating. If you look at the paths in the Lorenz attractor, you’ll see that things follow an orbital path – but there’s no good way to tell when two paths that are very close together will suddenly diverge, and one will pass on the far inside of the attractor basin, and the other will fly to the outer edge. You can’t watch a simulation for long without seeing that happen. While searching for information about this kind of stuff, I came across a wonderful demo, which relates to something else that I promised to write about. There’s a fantastic open-source mathematical software system called sage. Sage is sort of like Mathematica, but open-source and based on Python. It’s a really wonderful system, which I really will write about at some point. On the Sage blog, they posted a simple Sage program for drawing the Lorenz attractor. Follow that link, and you can see the code, and experiment with different parameters. It’s a wonderful way to get a real sense of it. The image at the top of this post was generated by that Sage program, with tweaked parameters. This entry was posted in Chaos, Fractals on July 13, 2009 by markcc.